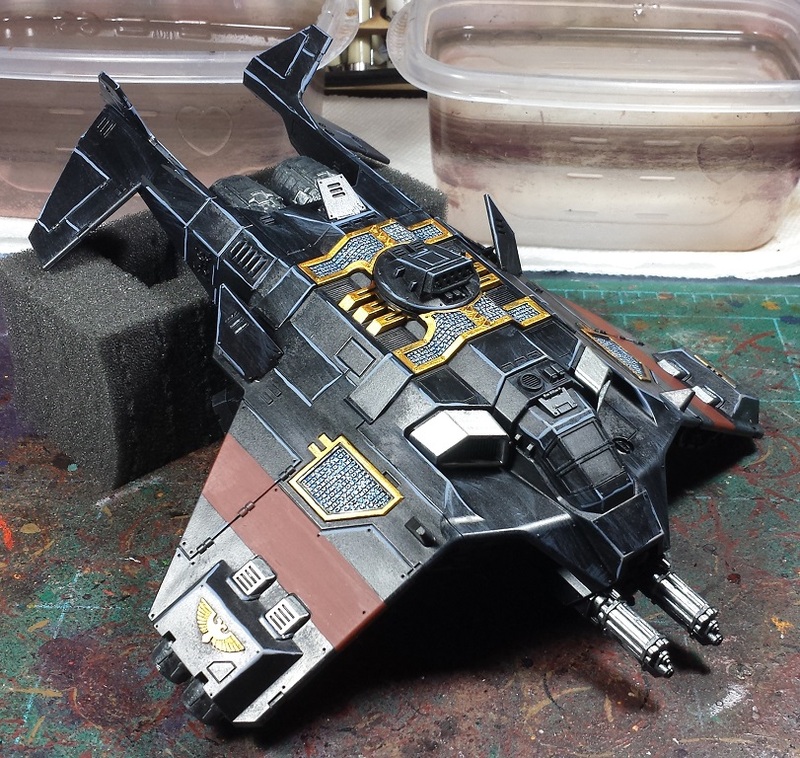 Another quick hit today, back when I started the Land Raider I'd also done the linework on the Corvus, and while I was working on the Dreadnought over the last couple days I'd also taken the time to lay in the initial colors on the flyer as well. My favorite part of the model is the big ol' inquisition symbol on the roof, rather happy I went with the underslung hurricane bolters so as not to cover it up. Still a ways to go of course, but I quite like how it's coming along thus far! Looking good so far. Not sure about the red stripe yet but I am sure time will tell on that. I love it! Just to follow up from Rory's comment, I can see his point, but I think maybe it's because the rest of the model has some quite extreme highlights whilst the red by contrast is quite flat. Few highlights in there and I think it will really add to the model, it looks great! I don't even have any Deathwatch (anymore) and looking at these pics makes me want to buy one! Looks great! Like you I think the inquisitor symbol is the best bit! Underslung makes better sense from a ground-attacking perspective anyhow. The red stripes could perhaps do with a little something to make them pop more? Otherwise I like this thing. Looks cool and yes, especially the Inquis symbol. @Nick Thrower: Indeed, that's just the basecoat Dark Flesh to block in the area, plenty more passes in brighter reds to help it pop to come! @Da Masta Cheef: Indeed, it's definitely the standout of the Deathwatch release. Great kit! @Dai: Absolutely - much more highlighting and brightening to go! 40k Genestealer Cult - The First Curse complete! 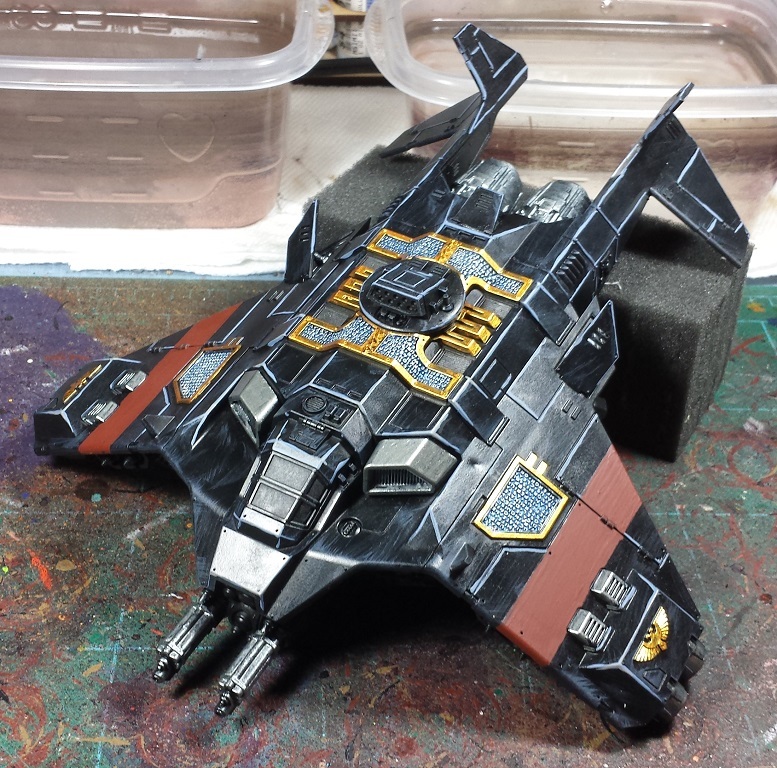 40k Deathwatch - Army 99.9% Parade Ready!